I hope everyone is having a great Thursday so far! 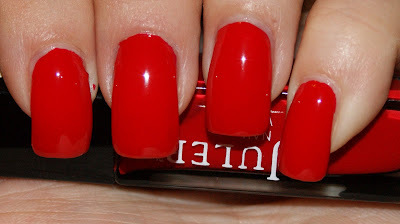 Today, I have for you a blood red creme polish that I have been waiting to try for a while now. I received it in my Easter Mystery Box... and unfortunately, it was obliterated. So that pushed it back for a while. However, I finally got to break it out this week! Julep January applied like a dream and dried pretty quickly. I usually have an issue with reds that lean towards the orange end of the spectrum because of my skin tone, but because January is more of a violet red, it was much more flattering. I know I'm a bit delayed on the July box, but I'm STILL waiting on my add-ons, so I will wait for those to arrive before reviewing it. Julep January, and all other Julep products, are available at Julep.com. January retails for $14.